On the field, and in the classroom, Natalie Konerth (BS applied mathematics) is scoring big. 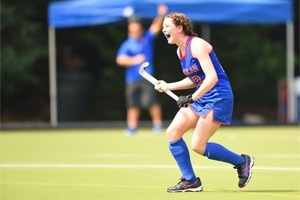 In early November, the senior forward from Huntingtown, MD, the Patriot League Field Hockey Scholar-Athlete of the Year Award for her second consecutive season. She is the second leading scorer in the league with 27 points, helping her team to a 5-1 record. And she's done all this while carrying a 4.0 cumulative GPA in applied mathematics—and as a Phi Beta Kappa member and a National Field Hockey Coaches Association (NFHCA) Scholar of Distinction. "Natalie took three of my upper-level courses," says Joshua Lansky, chair of AU's Department of Mathematics and Statistics. "She was the top student in each of these courses. She displayed a deep understanding of these ideas and very sharp problem-solving skills." Professor of Mathematics and Statistics John Nolan worked with Konerth on an intensive summer research project. "Natalie is a dynamic student and athlete," he says. "She first worked on a research problem, unraveling a published dense research paper and clarifying it; we also wrote a computer program to implement the method." The following summer, Konerth conducted an independent study that combined her talents: math and athletics. "She obtained data on student heart rates from the monitors worn by AU field hockey players," Nolan explains. "This contained large amounts of data that she analyzed, looking for differences in performance from different field positions and comparing practice versus game exertion." This fall, in addition to winning the scholar-athlete award, Konerth was named one of 11 members of the Field Hockey Academic All-Patriot Team, joining fellow Eagles Jess Davis and Maura Jacobs. Konerth credits the AU women's field hockey team for its emphasis on academic achievement. "I am extremely honored to have received this award," she says. "I am incredibly fortunate to be a member of a team that has made excellence in the classroom a part of our culture, and am grateful for this opportunity to represent AU field hockey."